Our stop for the night was at Miranda Hot Springs where the swimming pool is filled with naturally hot water. I made the most of good laundry facilities and we enjoyed a relaxing dip in the pool. Then it was onwards and upwards towards Auckland along the shores of the Firth of Thames. We could see the men working out on the oyster beds and passed a peacock farm. In Kawakawa Bay there was organised cockle collecting and a fisheries official checking people’s catch. The New Zealanders are very hot on the quantity and size of fish caught in order to preserve the stocks. We saw many signs outlining the rules and regulations. At Clevedon we stopped for coffee and enjoyed the Sunday farmer’s market. Then we hit the big time – motorway around Auckland. We only got lost once – old map, new roads – and emerged triumphant on the road to Helensville. The countryside in this area was fairly ordinary but we smiled at a firm advertising “One Shade of Grey” Cement. We worked our way up to Wellsford and across to Waipu Cove on quiet Sunday roads. Once again the camp site was virtually on the beach and we were the only ones wanting an evening swim. 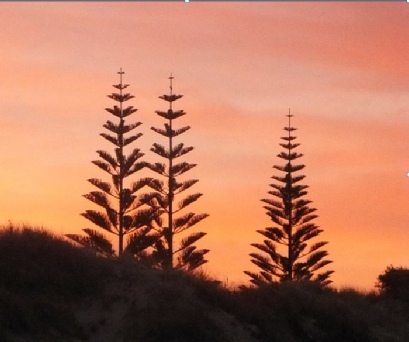 There was a beautiful sunset showing the Norfolk Pines at their best. Norfolk pines were planted by the early Christian missionaries as their growing tips are a cross at the top of the tree, a natural symbol for all to see. The beautiful beach encouraged us to swim again before breakfast the next morning. Our next stop was Whangarei which is situated at the head of Whangarei harbour –a large natural and sheltered bay where there are a lot of lovely sailing boats moored. It is also home of Claphams National Clock Museum where 1400 clocks tick and chime merrily. We made loo stop in Kawakawa (another Kawakawa) – not something one would normally note, but the loos here are extraordinary. They were designed by the Austrian-born artist Friedensreich Hundertwasser. Using bright ceramic mosaics and coloured bottles he created an interesting building with a roof of grass and plants. Many people stop to take photographs, making sure they are not in the middle of the road when Gabriel the steam engine runs on the line through the centre of town. The rest of the town has other mosaic work done by local students making it a fun place. We then returned to Paihia and the Beachside camp site where we had spent time on our first NZ trip. We enjoy Paihia and were impressed by the community project that has transformed the harbourside car park into a pleasant meeting place with petanque piste, outdoor piano and telephone box library. We had a couple of days R & R here before returning to Auckland so organised much needed haircuts and last minute souvenir shopping. At Keri Keri, where the Church Missionary Society started their work in New Zealand, we found that St James’ church has a problem with swallows. We visited the Waitangi Treaty grounds for a dose of history. Here you can see a traditional Maori meeting house (Whare runanga) and the Treaty House where the Treaty of Waitangi was signed. This gave sovereignty to Britain in a bid to provide a framework of law and order to the country. Unfortunately the hurried translation into Maori gave the chiefs a different understanding and a continuing difference of opinion. The traditional war canoe, Ngatokimatawhaorua, is also here. Built from huge kauri logs for the centenary celebrations it is the largest of its kind and is used every year on Waitangi day. Sadly we started packing and cleaning the van ready for our return to Auckland. Working our way south we found the first signs of autumn as it was quite foggy to start with. A final roadside coffee stop in Kaiwaka provided us with fantastic cheese and onion scones – warmed with butter. We will always remember the friendly Kiwi welcome we received at our regular stops and the yummy cakes and scones we sampled. Continuing along the coast to Waiwera and Orewa we needed a good walk before a late lunch. Then we negotiated the busy roads and crossed the harbour bridge to find our camp site on the south west of the city, near the airport. Next morning we returned our home on wheels to the airport area and caught the shuttle bus into the city. Our bus stop turned out to be right outside the hotel we had booked for the next couple of days. After living in what was basically a long wheel based transit van the hotel was luxury, complete with kitchenette with a dishwasher and our own bathroom – bliss after all those camp sites. We explored Auckland and saw the Round the World yachts in harbour and evidence of the World Cup Cricket. A trip up the Sky Tower was a must even though the weather wasn’t brilliant. There were good views across the city and harbour and scary glass floors on the top level – and in the lift! All the while there were people throwing themselves off the top on tethered bungees. We were glad to be inside. Finding the city rather crowded we spent our second day over in Devonport. Taking the ferry across the harbour we found Devonport to be much quainter and more peaceful, even with the park being the finishing line for the Coastal Challenge Full Monty marathon race that included beach running and scrambling over rocky headlands. We followed the Old Devonport Walk guided trail through town and up Mt. Victoria. From here there were wonderful views all across the harbour and surrounding islands. One of the great Maori Canoes landed here c. 1350 AD followed by the British Navy in 1840. Ship building began and the town grew. There are many lovely old houses and several churches to see. We had lunch at the Esplanade Hotel which was built in 1902 – and could have been transported straight from Brighton or Eastbourne. The Victoria Road shops are also well preserved examples of life 100 years ago. Catching the ferry back across to Quay Street we found the tail end of a street demonstration being escorted away by police, and in contrast, an open air Art and Jazz Festival in Aotea Square. Once again the bags were packed and we were ready for the bus back to the airport the next morning. Thank you New Zealand for a wonderful travel experience and for making us so welcome. Australia here we come!